In selecting contact materials for a specific application, the design engineer will have to find the proper balance in material selection that allows the greatest likelihood of success. Generally, as the conductive metal (silver or copper) increases, contact resistance decreases and electrical and thermal conductivity increase, but contact erosion and contact "sticking" or welding become more of a concern. In contrast, as the refractory metal content increases, contact wear decreases and there is less likelihood of contact “sticking” or welding. CTI encourages you to discuss your application requirements with a CTI representative as early in the design process as possible. In addition to aiding in the selection of the material, CTI can tailor the material to suit your application. 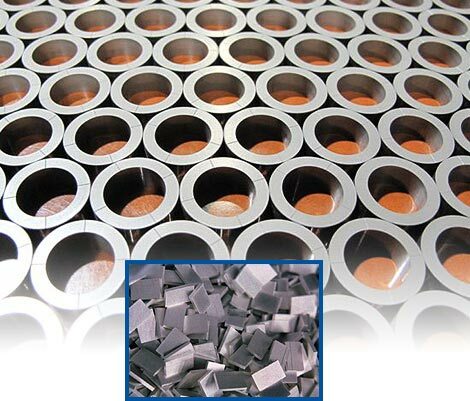 Adjusting material particle sizes, choosing additives, and altering furnace temperatures all play a role in the final properties of the selected contact material. CTI can help you design the most cost-effective contact. A discussion of the most popular contact materials follows. Silver tungsten is by far the most popular of the contact material families used in circuit breakers and other power switching devices. The superior conductivity of the silver combined with the ability of tungsten to withstand mechanical and electrical wear make this the ideal material for use in oxidizing atmospheres and where severe arcing is anticipated. The CTI family of silver tungsten contact materials range from a low of 10% silver to a high of 90% silver. In addition to varying the composition, CTI engineers can modify the contact material by changing process parameters. This may include changing particle size, furnace temperatures, as well as the addition of additives. Silver tungsten carbide has proven to be an excellent material because of its ability to resist contact “sticking” or welding and also because of its resistance to oxidation. Because it is a harder material than silver tungsten, AgWC is more resistant to arc erosion and contact wear. As with AgW, changes in processing will produce varying application results. CTI produces AgWC materials ranging from 35% silver and 65% tungsten carbide to 60% silver and 40% tungsten carbide. In some instances, it is advantageous to have a combination of tungsten and tungsten carbide mixed with silver. Copper tungsten and copper tungsten carbide offer low-cost alternatives to silver tungsten and silver tungsten carbide when used in non-oxidizing conditions. Vacuum as well as oil and gas filled devices often use copper tungsten contacts. In air, the material is frequently used for arcing contacts or where there is sufficient contact force to break through the oxides that are inevitably formed. Silver graphite has become a very common stationary contact material and is typically paired with AgW or AgWC. Most circuit breaker and switch grades contain 95% to 97% silver. Silver graphite has superior anti-welding characteristics and therefore is a good choice when tack welding is an issue. In addition, silver graphite has excellent electrical conductivity due to the typically high silver content and because of the reducing gas formed by graphite. A much softer material than silver tungsten or silver tungsten carbide, silver graphite has a higher erosion rate. CTI is particularly adept in the manufacture of these materials because of its vast experience in high graphite sliding contacts. Silver tungsten carbide graphite based materials are used in many applications as a replacement for silver graphite. This material is less costly than comparable silver graphite materials and exhibits the positive characteristics of both silver graphite and silver tungsten carbide. When used as a stationary contact, AgWC has good thermal and electrical properties and has minimal contact erosion. This material satisfies applications requiring both the UL and IEC approval, eliminating the need for two versions of a stationary contact. 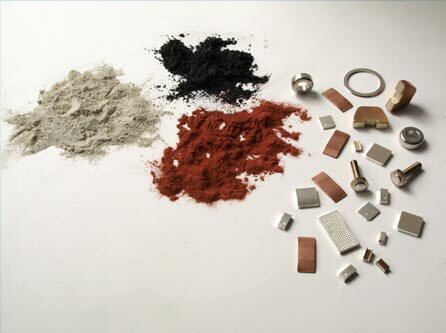 CTI manufactures many other grades and families of materials including, but not limited to, silver molybdenum (AgMo), silver nickel (AgNi), Copper Graphite (CuC), and fine silver. You are invited to challenge CTI with virtually any powder metal material composition.